Home / News, Other Political News, Politics / Arrogant SWAZURI fired from NLC just 2 weeks after saying he will rather die than resign! Where will he take his four wives? Arrogant SWAZURI fired from NLC just 2 weeks after saying he will rather die than resign! Where will he take his four wives? Tuesday August 15, 2018 - National Lands Commission (NLC) chairman, Mohamed Swazuri’s position at the NLC has been taken by his deputy, Abigael Mbagaya Mukolwe. In a statement issued by NLC on Wednesday, the commission said Mukolwe is now the acting Chairperson. “The Commission wishes to state that the Commission is fully constituted with the Vice Chairperson, Abigael Mbagaya Mukolwe performing the duties of the office of the chairperson, as has always been the case when the incumbent is out of office,” the statement added. The move comes after Anti Corruption Court Senior Magistrate, Lawrence Mugambi, banned Swazuri from visiting NLC offices in Nairobi. 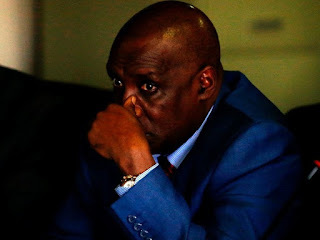 Swazuri and six other senior NLC officials were arrested on Saturday in connection with loss of Sh 231 million during the Standard Gauge Railway compensation. The chairman together with Tom Aziz Chavangi (CEO - National Land Commission), Salome Munubi (NLC - Director Valuation and Taxation), Francis Karimi Mugo (Director, Finance and Administration) and others denied charges levelled against them and were released on a cash bail of Ksh.3.5 million each on Monday.